Here is a quick tip on how to change the font size of blog description for Simple Template by Josh Peterson. I know there are many of you are using the free Simple Template provided by Blogger. Like many of you, I find the font sizes are not very appealing. One of them is the font size of blog description. 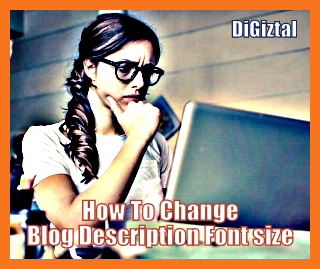 Below I will show you how to alter the blog description font size. 2. At the Dashboard, pull down the slider and click on "Theme". 3. Then click on the "Customize" button. 4. Next click on "Advanced". 5. Pull down the slider and click on "Add CSS". A box will appear next to it. 6. Now paste the code below in the empty box provided. Note: You need to change the number 10px to whatever size that suits you. 7. Finally click on "Apply to Blog" button.